This is our custom-built RJ-45 Specialty 1 channel cable. These cables are often used for broadcast consoles, they can also be used for CAT-5 pass-through applications. Construction is shielded RJ-45 to your selection of Neutrik connectors with Mogami 2944 cable. Neutrik connectors are some of the best connectors around. 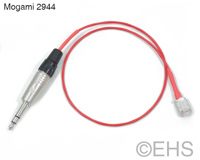 Mogami 2944 is a balanced "microphone cable" style cable and is very flexible, durable, light-weight cable, with a similar design as the channels in the Mogami snake cables. Balanced connectors will be wired using the most commonly accepted pin configurations. For unbalanced connectors low and ground will be tied. If you have any special requirements please let us know. There are multiple pinouts for the RJ-45 end of this adapter. In the field below "Gear Make/Model" please provide us the make and model of the gear at the RJ-45 so we can confirm the pinout (example: Radio Systems Millennium-D). Please also select the "Gear Pinout" field that fits your needs. If this adapter is to connect to existing cat-5 network cabling for use as a pass-through, please indicate that also. Omission will result in an order delay while we contact you.